The insert can be a single part or product, or a combination of single components that are carefully configured inside the tool and then sealed together with the plastic during the insert-molding process. This can actually result in greater strength, flexibility, or functionality, compared to attaching the individual parts separately during post-production assembly operations. Secondary steps can often be reduced or eliminated entirely with insert molding, saving time and reducing production costs. Many people think insert molding is limited to standard compression limiters — metal cylinders that are insert-molded to create plastic-covered parts and are bolted to other components, such as brackets or mounts (the compression limiter maintains the load of bolted joints, preventing plastic creep or hoop stress over time). However, other products that can be insert-molded include bearings, custom stampings, flexible circuits, and parts made from powdered metal or rubber. Insert molding provides several cost and design benefits. Sometimes insert molding improves manufacturability by replacing some post-tool assembly operations such as snap fits, gluing, and the use of screws or other fasteners. It also provides some cost savings with part number reductions, supplier consolidation, and part tracking and shipping. Regarding durability, encapsulating a part with plastic using insert molding often results in a much stronger part and joint, compared to what could be created through secondary assembly operations. For some, minimizing the risk of part defects while ensuring timely speed to market is a challenge. It is still common in the injection molding industry to do insert molding manually, using operators to load and unload inserts into a horizontal machine. Cycle times can vary drastically from one run to the next, meaning that thermal conditions and other factors can be different and create inconsistent outcomes. Some injection molders — like Kaysun — use automation technology and both horizontal and vertical machines for insert molding to help minimize human error, improve efficiencies, and ensure optimal outcomes in the injection molding process. For example, our vertical machines are very well-suited for loading inserts. We also use automation and end-of-arm tooling to ensure that parts are always inserted correctly. Missing an insert can cause several problems, ranging from downtime or mold damage to quality issues and field failures for the customer. It is essential to have high-precision controls and processes in place to manage the insert molding operation and maximize quality — especially for meaningful and effective Design Failure Mode and Effects Analysis (DFMEA). Each design is different and presents unique insert-molding challenges — especially for loading, holding, and filling around inserts. Loading and holding components can be quite complicated and depends on factors such as material, geometry, and function. The expertise of operators and engineers is still crucial in an age of automation. Sometimes creativity and flexibility are required to come up with the best solution. Methods that can be used to hold a part range from clamps to vacuum to magnets. Other considerations for insert molding include material flow and cooling. Understanding the cooling impact and flow disruptions the inserts have is essential for creating a perfect part. The material will also cool and shrink around the part, so managing the amount of pressure that can be applied is also important. The takeaway: Insert molding can be a highly effective process that works with a variety of materials and part geometries. 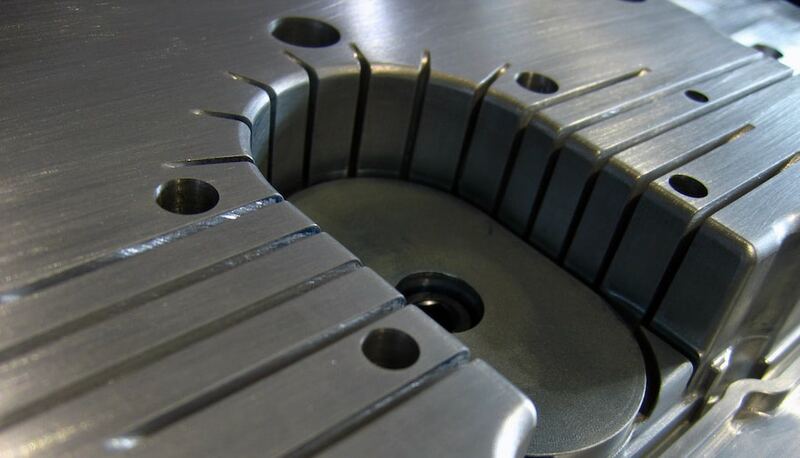 In most cases, it can result in cost savings and design improvements for parts that maximize manufacturability and improve customer satisfaction. To help you determine material selection and the factors that need to be considered, such as thermal conditions, chemical exposure, physical loads, and more, view our Rise Above the Competition: Multi-Material Injection Molding infographic below.